Wearing your heart on your sleeve is so last year. Now you can attach it to your keys, lanyard, bag and more! This darling little thing is made of red felt. It’s cut out by hand, making it a completely unique piece. No patterns were used in the making of this item. The lanyard clip is attached by a shiny silver string that has a loop like texture, which is then sewn securely inside the felt. This piece is machine sewn “haphazardly” around the edges with invisible thread to give another interesting texture. A single colorful button is sewn on with embroidery floss. This keychain has been filled with store grand sand as opposed to poly fiber stuffing. It remains light weight and sturdy while giving the piece a unique feel. However, I would gladly make a heart with cotton stuffing upon request. 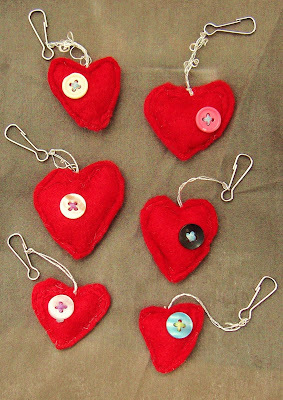 Because they’re all different, each heart keychain’s measurements vary slightly. The hearts themselves span approximately 1 to 1 ½ inches. The length of the lanyard and string are on average 1 to 2 inches.